The Funeral Mass for Cardinal Edmund Casimir Szoka will be at 11 a.m. Tuesday, August 26, at the Cathedral of the Most Blessed Sacrament in Detroit. Detroit Archbishop Allen H. Vigneron will preside at the service. Cardinal Szoka’s body will be received into the Cathedral at 2 p.m. on Sunday, August 24, with visitation lasting until 9 p.m. A prayer service, the Office of the Dead, will take place Sunday evening at 7 p.m. Visitation also will take place at the Cathedral from 2 p.m. until 9 p.m. on Monday, August 25, with a Rosary service at 3 p.m. and a vigil service at 7 p.m.
Cathedral of the Most Blessed Sacrament is at 9844 Woodward Avenue in Detroit. The Archdiocese of Detroit this morning shared news of the death of Cardinal Szoka, who served as Archbishop of Detroit from 1981 until 1990 and went on to oversee the government of the Vatican City State under Pope John Paul II and Pope Benedict XVI. Following his retirement from active ministry in 2006, Cardinal Szoka had been living in Northville. He died last night, August 20, of natural causes at Providence Park Hospital in Novi. He was 86. Edmund Casimir Szoka was born Sept. 14, 1927, in Grand Rapids to Polish immigrants Casimir and Mary Szoka. His father had immigrated from what is now Belarus; his mother from Poland. Cardinal Szoka was celebrating his 60th anniversary as a priest this year, having been ordained by Bishop Noa on June 5, 1954, to serve the Diocese of Marquette. He had served as chancellor in the Diocese of Marquette until being named the first bishop of the newly created Diocese of Gaylord in June of 1971. After establishing the Diocese of Gaylord, Pope John Paul II named him Archbishop of Detroit. He was installed to the post in May 1981. The pope then made him a cardinal in June of 1988. Shortly thereafter, he was appointed to oversee economic affairs at the Vatican City State, in April of 1990, and was succeeded in Detroit by Archbishop (Cardinal) Adam J. Maida. Cardinal Szoka oversaw the Vatican City State under both Pope John Paul II and Pope Benedict XVI. He was made President of the Governatorate of Vatican City State in 1997, and president of the Vatican City State in 2001. A day after his 79th birthday in 2006, Pope Benedict XVI accepted Cardinal Szoka’s resignation. More biographical information on Cardinal Szoka is available at http://www.aod.org/szoka/. 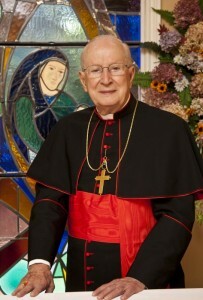 Articles and photos about Cardinal Szoka are available at The Michigan Catholic newspaper website, www.themichigancatholic.com.